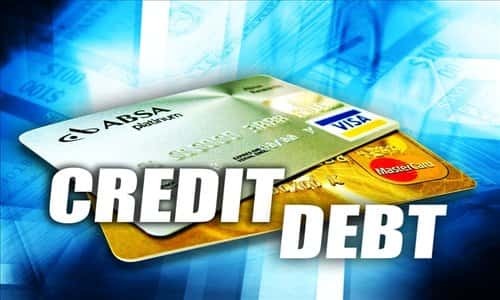 ... it won't come as a surprise that according to the just released latest quarterly household debt and credit report by the NY Fed, Americans' debt rose to a new record high in the second quarter on the back of an increase in every form of debt: from mortgage, to auto, student and credit card debt. Aggregate household debt increased for the 12th consecutive quarter, and are now $164 billion higher than the previous peak of $12.68 trillion set in Q3, 2008. As of June 30, 2017, total household indebtedness was $12.84 trillion, or 69% of US GDP: a $114 billion (0.9%) increase from the first quarter of 2017 and up $552 billion from a year ago. Overall household debt is now 15.1% above the Q2 2013 trough. Mortgage balances, the largest component of household debt, increased again during the first quarter to $8.69 trillion, an increase of $64 billion from the first quarter of 2017. Balances on home equity lines of credit (HELOC) were roughly flat, and now stand at $452 billion. Non-housing balances were up in the second quarter. Auto loans grew by $23 billion and credit card balances increased by $20 billion, while student loan balances were roughly flat. Confirming the slowdown in mortgage activity, mortgage originations in Q2 declined to $421 billion from $491 billion. Meanwhile, there were $148 billion in auto loan originations in the second quarter of 2017, an uptick from the first quarter and about the same as the very high level in the 2nd quarter of 2016. Auto loan balances increased by $23 billion, continuing their 6-year trend. Auto loan delinquency rates increased slightly, with 3.9% of auto loan balances 90 or more days delinquent on June 30. The aggregate credit card limit rose for the 18h consecutive quarter, with a 1.6% increase. Outstanding student loan balances rose modestly, and stood at $1.34 trillion as of June 30, 2017. The second quarter typically witnesses slow or no growth in student loan balances due to the academic cycle. As discussed previously, a perilously high 11.2% of aggregate student loan debt was 90+ days delinquent or in default in 2017 Q2. In a troubling development, the report noted that the distribution of the credit scores of newly originating mortgage and auto loan borrowers shifted downward somewhat, as the median score for originating borrowers for auto loans dropped 8 points to 698, and the median origination score for mortgages declined to 754. For now this credit score decline has not impacted the credit market: about 85,000 individuals had a new foreclosure notation added to their credit reports in the second quarter as foreclosures remained low by historical standards. And while much of the report was in line with recent trends, and the overall debt that was delinquent, at 4.8%, was on par with the previous quarters, the NY Fed did issue a red flag warning over the transitions of credit card balances into delinquency, which the New York Fed said "ticked up notably." Discussing the troubling deterioration in credit card defaults, first pointed out here in April, the New York Fed said that credit card balance flows into both early and serious delinquencies increased from a year ago, describing this as "a persistent upward movement not seen since 2009." As shown in the chart below, the transition into 30 and 90-Day delinquencies has, over the past two quarters, surged to the highest rate since the first quarter of 2013, suggesting something drastically changed in the last three quarters when it comes to US consumer behavior. "While relatively low, credit card delinquency flows climbed notably over the past year," said Andrew Haughwout, senior vice president at the New York Fed. "This is occurring within the context of loosening lending standards, as borrowers with lower credit scores recover their ability to access credit cards. The current state of credit card delinquency flows can be an early indicator of future trends and we will closely monitor the degree to which this uptick is predictive of further consumer distress." That bolded statement, is the first official warning by the Fed that the US consumer is sick, and the Fed has no way reasonable explanation for this troubling jump in delinquencies. Timestamp it, because this will certainly not the be the last time the Fed warns about the dangerous consequences of all-time high credit card debt. As for the "further uptick in consumer distress", we are just guessing but the fact that credit card defaults are jumping at a time when sales at fast food and other restaurants have declined for 17 consecutive quarters, and when $250 billion in US household savings was just "revised" away, may all be connected. Originally published at the Daily Sheeple - reposted with permission.